Switches come in many different colors, types, and grades. If you shop around for switches, you'll see that some may cost under a dollar and yet others may cost a few dollars. Standard switches are the cheaper residential variety that everyone seems to flock to. The price is unbelievably lower than the commercial type, so what is the difference between the two? A standard switch will still turn the lights on and off just fine, but the construction of the commercial type is more stout and with better contacts. You know what they say, "You get what you pay for." The commercial switch will last longer due to heavier contacts for switching longevity. Some hardware stores may list commercial grade switches as their "Pro" grade switches. You can decide which grade is best for your installation. But if you ask me, I'd spend more for quality, instead of replacing the switches every couple of years. Cheaper isn't always better because after replacing a cheaper grade switch a few times, you could have bought the commercial grade switch and saved yourself the repetition of replacing the switch over and over. After all, nothing lasts forever. The first step in installing a single-pole switch is to turn off the power to the circuit that you'll be working on. To do that, simply go to your electrical panel and turn off the breaker feeding that circuit. In the event that you have a fuse panel, you'll have to locate the fuse that controls that circuit. Simply find the fuse and unscrew it from the socket. To check this, use an electrical tester to see that the power is on before you turn off the breaker or unscrew the fuse. The first step in installing a single-pole switch is to turn off the power to the circuit that you'll be working on. To do that, simply go to your electrical panel and turn off the breaker feeding that circuit. If you have a fuse panel, you'll have to locate the fuse that controls that circuit. Simply find the fuse and unscrew it from the socket. Single-pole switch removal is easy enough to do. First, remove the two straight-bladed screws that hold the switch cover plate on and remove the cover plate. Be careful to place them somewhere safe so you can install them later. 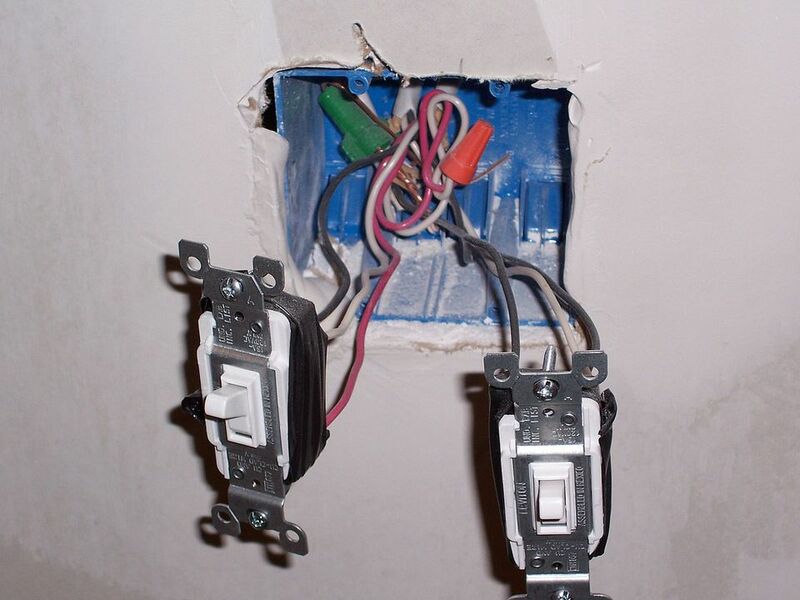 Then, remove the two screws that hold the switch to the junction box. These screws usually allow you to use a straight or Phillips tip screwdriver to remove them. Carefully pull the switch from the box and check it once more to be sure the power is off to the circuit feeding the switch. A single-pole switch has three wires connected to it, a hot wire, a switch leg, and a ground wire. If your switches don't have all three, it's time to change them right away. The hot wire is the feeder wire that is connected to the circuit breaker or fuse in the electrical panel. This wire is connected to one of the side brass terminals of the switch. The switch leg is the wire that feeds the light from the switch. When the switch is turned on, the electricity flows through the switch to the light. This wire connects to the other brass terminal on the side of the switch. The ground wire is either the bare or green wire and is connected to the green-colored screw of the switch. This screw is located at one of the ends of the switch and is bonded to the metal bracket of the switch that attaches to box. Using a screwdriver, unscrew the screws and remove the switch wires from the switch one at a time. It's a good idea to observe the way the wires were connected.